Legendary Los Angeles retailer Fred Segal® today announced the launch of fredsegal.com and accompanying social channels including Instagram, Pinterest, Facebook and Twitter. The site will go live on August 26, 2015. 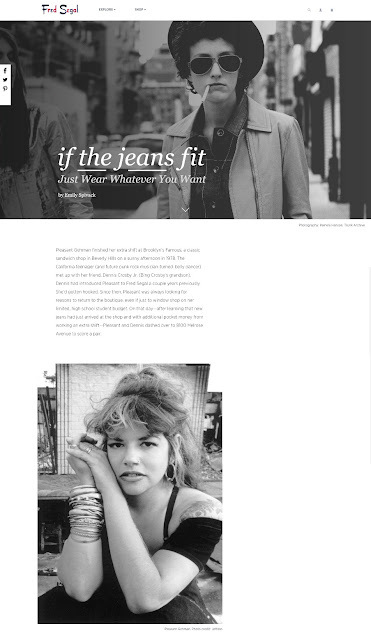 The centerpiece of the brand’s digital presence, fredsegal.com is a content-driven experience featuring insightful, engaging and shareable contributions revolving around a particular topic of interest, or “Rivet.” The debut “Rivet” focuses on denim, as Fred Segal was the originator of fashion jeans in the 1960s. A number of well-respected writers and tastemakers contributed to the site on this subject, including Emily Spivack, creator of the Worn Stories site; Melissa Magsaysay, cofounder of The Hive and former style writer for the Los Angeles Times; James Sullivan, author of Jeans: A Cultural History of an American Icon; actress/musician Sasha Spielberg; celebrity stylist Molly Fishkin; and journalist Yale Breslin, among others. Visitors to the site will be able to shop a highly-curated selection of men’s and women’s apparel to accompany the denim Rivet, with a focus on jeans from brands such as 3x1, Fabric, Ksubi and Mother, to name a few. Exclusive, limited edition and collaborative merchandise will also be a hallmark of the site and will change frequently. Since 1961, Fred Segal has been an iconic shopping destination rooted in Hollywood culture and synonymous with L.A. laid-back luxury. Known for discovering and launching many famous fashion and beauty brands, Fred Segal was a pioneer of experiential retail. Today, Fred Segal offers a mix of highly curated merchandise and lifestyle offerings at its locations in Los Angeles and Tokyo, Japan, its first international flagship, and online at fredsegal.com. Thank you for taking the time to read our fashion retail blog post. We hope that you have found this news to be informative. If you have comments or questions, please add your thoughts in the discussion area below.